How healthy does that look?? But, you can’t even taste the vegetables and would have no idea that there is spinach and kale in there. 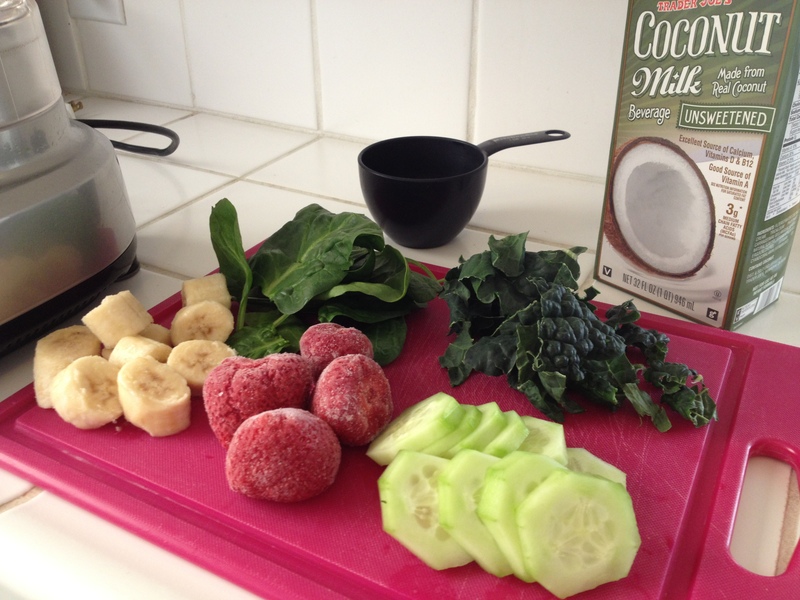 First mix together the kale, spinach, frozen bananas and your choice of milk. I used unsweetened coconut milk, but you could also use soy or almond to keep it a vegan smoothie. 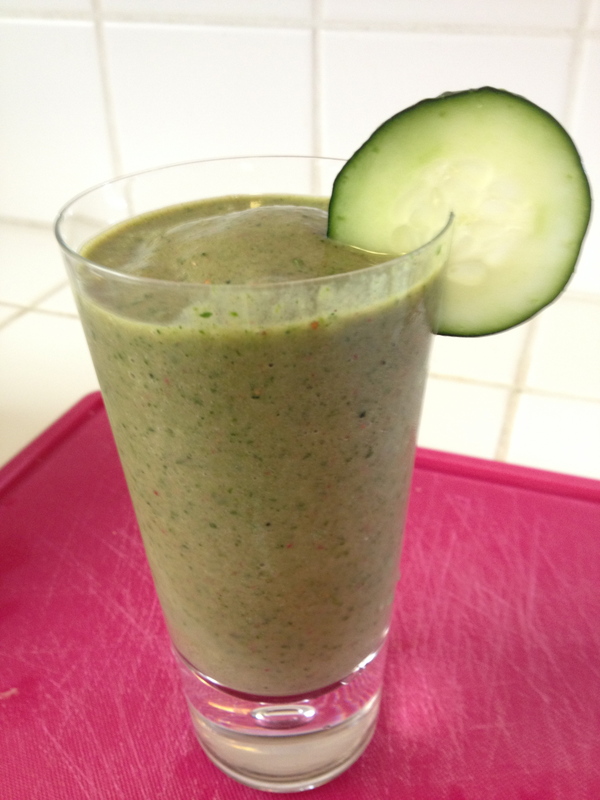 Then, blend in the strawberries, cucumber, a few ice cubes, and your detox smoothie is ready! I plan to have this for breakfast all week! This recipe is enough for 1-2 servings. 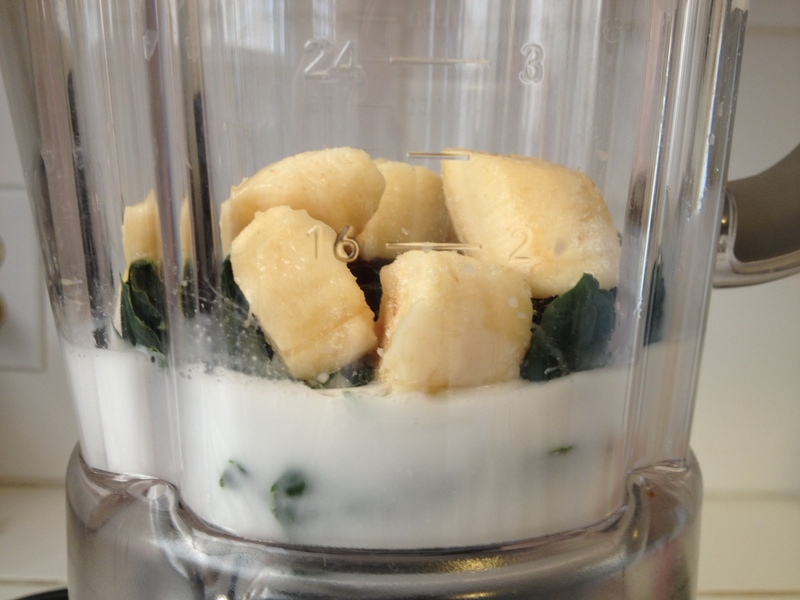 Add the almond milk to a high-power blender and toss the banana pieces and kale in. Blend on high. Add the strawberries and cucumber. Blend again until smooth. Add in more almond milk, some orange juice, and/or ice for desired consistency. Does anyone else avoid using their blender because they don’t want to clean it? That’s how I felt until Jimmy shared this great tip with me! 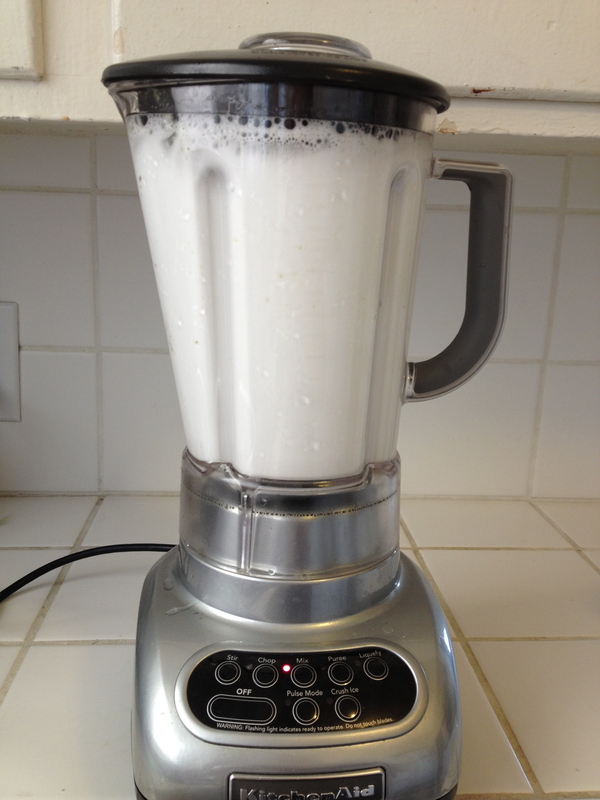 Now, I don’t think twice about it….First, rinse the blender out with water, then add some more warm water with soap, but it back on the mixing stand and blend for a few seconds to get it all soaped up. Just one more rinse and it’s as clean as new! My friend Denise taught me a great trick: Massage the kale in your hands, just give it a few squeezes like a stress ball, to reduce the toughness. The first time I made this salad, I used mango. This time, the mangos weren’t ripe, so I tried it with nectarines, which was equally great. I would definitely use them again. 1. 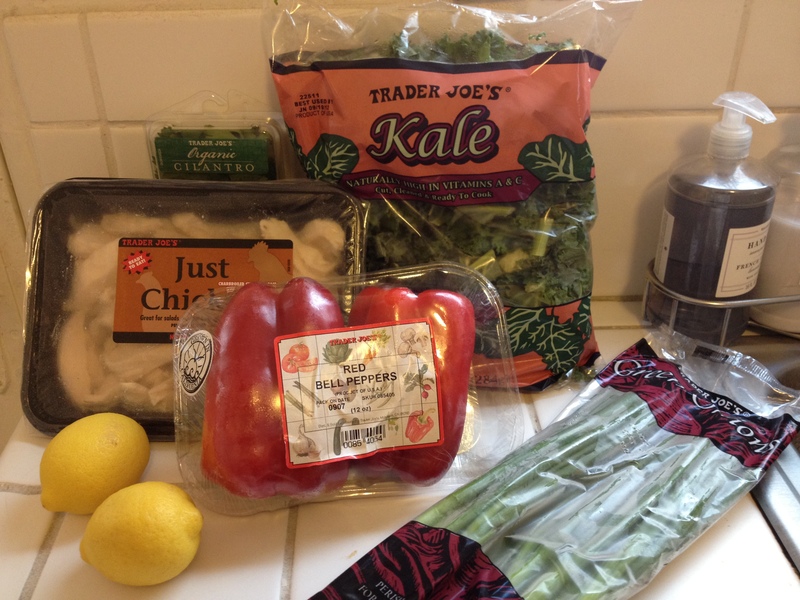 Fill a saucepan with water and chicken or vegetable broth and quinoa. Bring to a boil and then reduce heat to medium low. Simmer for 15 minutes or until liquid is absorbed. Fluff with a fork and cool in refrigerator (best to make ahead of time if possible, so it’s chilled when ready to eat). 2. Dice mango and red bell pepper. 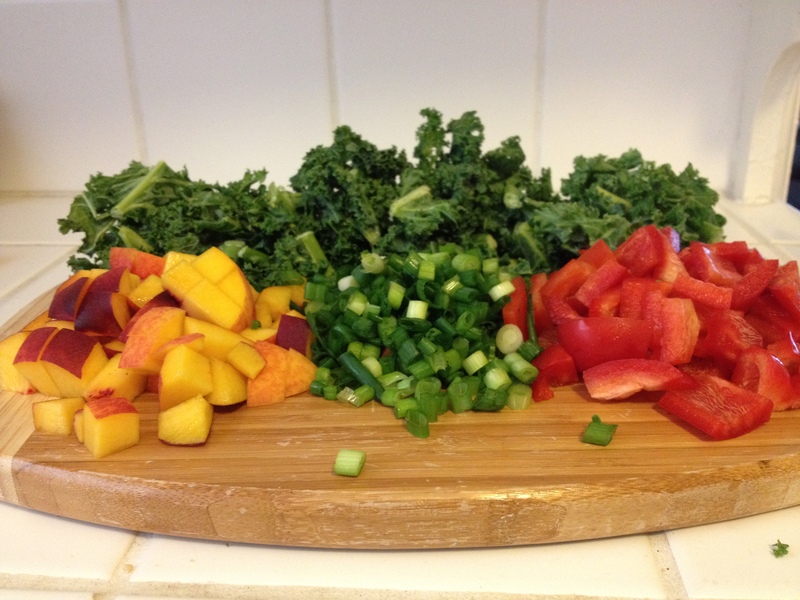 Massage and chop kale, and chop scallions, cilantro, and mint. 3. Whisk together lemon juice, lemon zest, olive oil, red wine vinegar, salt, and pepper. 4. 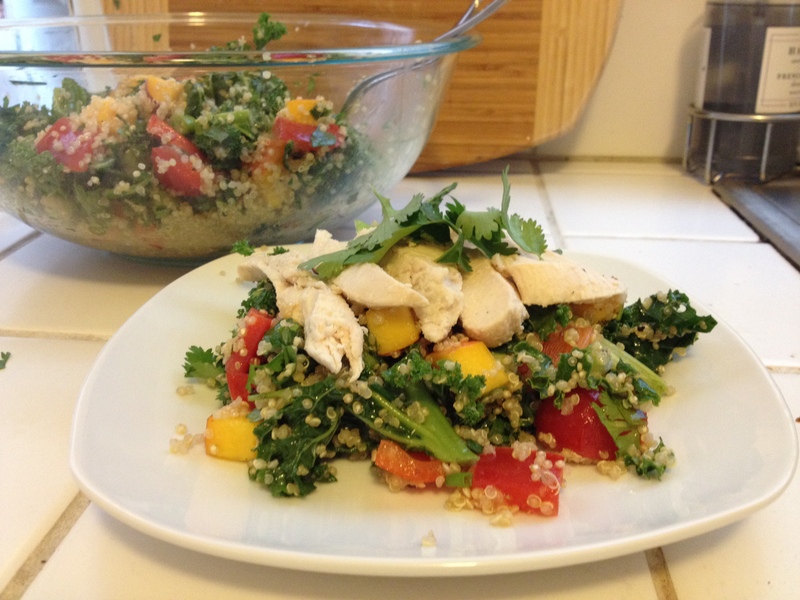 Toss the quinoa with the dressing, add all of the other diced/chopped ingredients, and top with chicken. 5. Garnish with cilantro, mint, and lemon zest and season with salt and pepper.